Birmingham’s reputation is heating up, with several national publications in recent months citing it as an address ripe for both tech and traditional advancement. 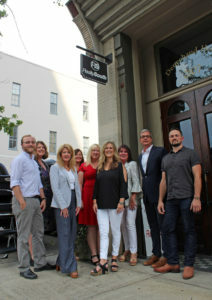 RealtySouth, which has been selling real estate in downtown Birmingham since 1955, recently doubled down on the area by locating a new office in the historic Denechaud House, at 2nd Avenue North and Richard Arrington Jr. Boulevard North, adjoining the Florentine Building. A dozen or so agents will be operating out of the location, according to Managing Broker Greg Comer. The Denechaud House, originally the Denechaud European Hotel and Restaurant, opened its doors in 1887 under the ownership of New Orleans hotelier E. F. Denechaud. His sons, Edward and Louis, operated it for two years but success was fleeting and they returned to New Orleans. The building, crowned with a striking cornice that sets off equally elaborate window casings, saw many uses after that, including as a grocery store, a sewing machine company and a paint supply store. “It seemed appropriate to select an established location for an established market leader,” says RealtySouth CEO Richard Grimes.